Meek Mill is enjoying the best Jamaica has to offer. The American rapper and his Dream Chasers crew started their day off on Tuesday feasting on a Traditional Jamaican breakfast which we are told included ackee and salt fish, roast breadfruit, fried dumplings, yam, banana, brown stew chicken, cornmeal porridge and more. 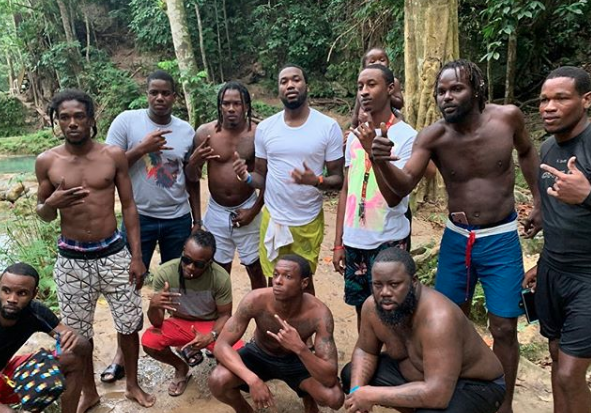 Meek Mill then went on the Island Gully Falls tour in Blue Hole, Ocho Rios. The Philly rapper is also on the island with his new girlfriend, Milan, owner & founder of Milano Di Rough. Meek Mill arrived in Montego Bay, Jamaica at the Sangster International Airport via his private jet on Monday night.